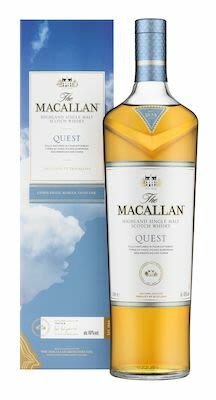 Macallan Quest, Speyside Giftbox 100 cl. - Alc. 40% Vol. Entirely matured in hand–picked European and American oak casks, The Macallan Quest tells the story of wood journeying over 20,000 miles. It explores the search across European and American forests for wood to craft four different cask types, European and American sherry seasoned, American ex bourbon and hogshead casks. The range of four cask styles allows you to explore the soft blend of citrus fruits perfectly balanced with sweet notes of vanilla oak.